The Glory and the Madman: Part 2 God is Dead? “What do you mean” I asked. “I mean God is dead” he said. “Have I killed Him? ” I asked recalling a line from Nietzsche’s madman. “No He is a felon. He did it to Himself” he replied. Listen to the angst in the agitated soul who sees God as dead. The angst is not so much from watching God’s death from an abortion of His own being in the cosmos . Nor is it a view of the suicide bombing of a Deists galaxy of belief, But ,rather it is written as an interrogator investigating the crime scene of a murder. Where is God gone? he called out. “I mean to tell you!! We are all his murderers! But how have we done it? How were we able to drink up the sea? Who gave us the sponge to wipe away the whole horizon? What did we do when we loosened this earth from its sun? Whither does it now move? Whither do we move? Away from all suns? Do we not dash on unceasingly? Backwards, sideways, forewards , in all directions? Is there still an above and below? Do we not stray, as through infinite nothingness? Does not empty space breathe upon us? Has it not become colder? Does not night come on continually, darker and darker? Shall we not have to light lanterns in the morning? Do we not hear the noise of the gravediggers who are burying God? do we not smell the divine putrefaction? For even gods putrefy? God is dead! 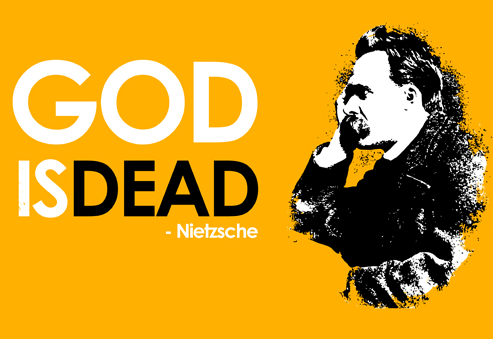 God remains dead! And we have killed him! I looked over at my father, I had grown tired of defending God. I had grown tired as I pulled up to the Cancer Center. My readiness and my answer for the hope I carried within me felt depleted. I said “go ahead , go to the check in and I will meet you after I park”. He smiled as a boy who had first won a fight with his mother, Impish yet naive. He did not know of the havoc over his soul in heavenly places. Perhaps, Frederick N and my father, Lord M have killed God with their minds. Their minds bent on logic and science as the measurement of the possible life of one called “God”, extinguished the possibility by probability. And yet, both probability and possibility, are merely by products of a Creator of all things. For the atheist to cling so solemnly to Nietzche’s cry is in itself a cry of contradiction . How foolish to say He is dead and at the same time so claim Him as having existed . Declaring His dead existence only limits His scope of existence. It sets His existence in a time frame not in Eternity.. I got out of the truck . The air was tenderly crisp. The flowers were budding in the front of the center. Creation was declaring a beauty. And in the beauty was a cry of Infinite Being . The cry of one who does not need an attorney for He represents Himself . He is saying “I am not Dead. Even though you try to kill me. Even when you say I have not heard. I have not acted , I say . I AM.” I AM. The breeze seemed to whisper “I AM”. And Job replied “I had heard of you by the hearing of the ear, but now my eye sees you: Therefore I repent”. And so I too repent of killing you , limiting you in my mind FATHER.